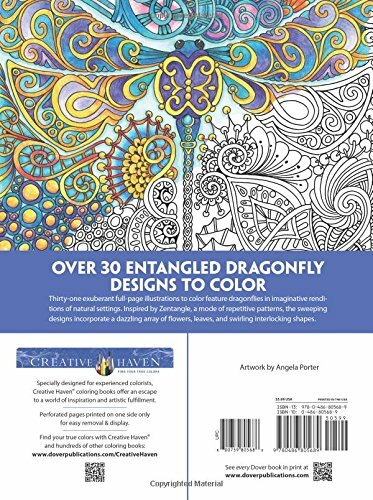 Another lovely coloring book from Dover's Creative Haven series. 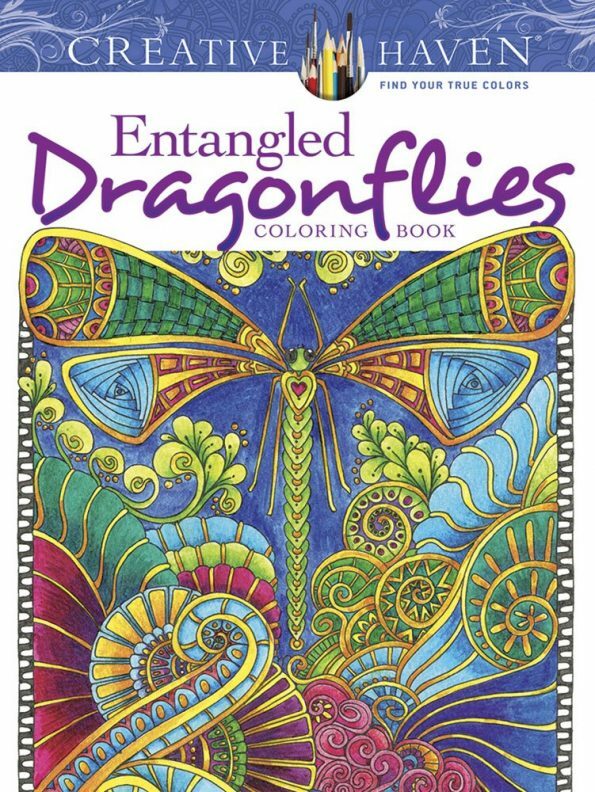 This one features beautiful dragonfly coloring pages, drawn in "entangled" style. So what's an entangled design? 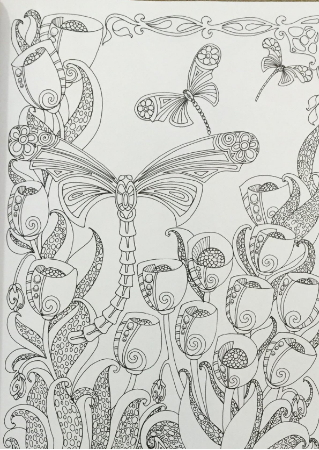 It's based on the popular zentangle approach, which uses illustrations created from repetitive patterns to promote relaxation. 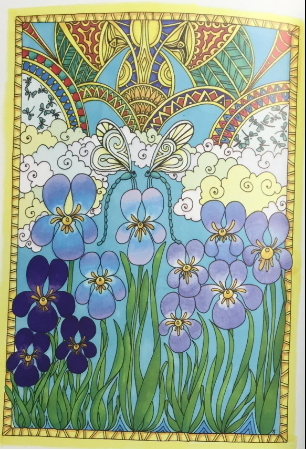 Personally, I like to color everything from geometric mandalas to traditional illustrations. Angela Porter's designs are a fabulous blend of free-form illustration combined with patterns that swirl and intertwine. The drawings have moderate to advanced details and use fine lines that don't detract from your colors. Besides the dragonflies, you'll discover leaves and flowers that give the drawings the exuberant feel of a summer garden. Coloring them offers an experience of mesmerizing beauty. The publishers, as usual, come through with a quality product, offering 31 beautiful coloring pages in 8.5" x 11" format. Paper quality is very good. The pages are printed on one side only, and are perforated for easy removal. Be aware that almost any paper will allow a bit of bleeding from certain markers, such as alcohol based ones, or those that are very pigment-heavy. For this reason, I always appreciate perforated pages and think the best approach is to remove the page before coloring them. That way you get a great flat surface and eliminate the possibility of damaging an underlying page. Many people like to copy the originals onto their own paper stock - 80 lb card stock can be great - and detaching the pages first makes for perfect copies. 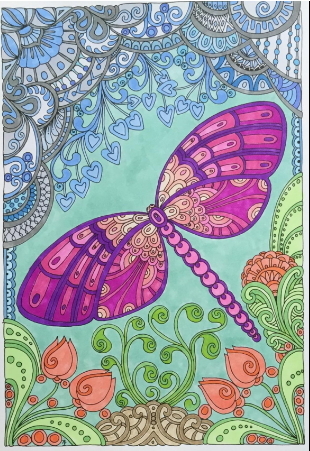 The dragonfly wings offer a great chance to practice more advanced coloring techniques and to try for a translucent and/or shimmery effect. You can try combining and layering Copic markers and Prismacolor or Holbein pencils. 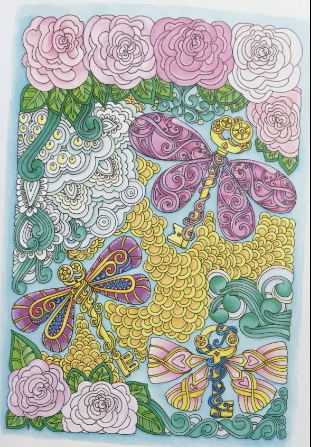 This book is another great example of how coloring can be a relaxing, creative and joyful process. It is advanced enough to keep you intrigued and focused, contributing to the wonderful de-stressing state of bliss this activity provides.